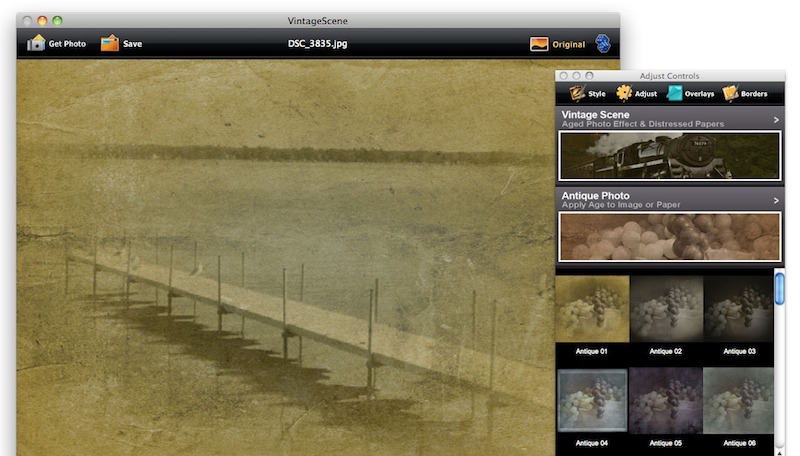 Vintage Scene 2.52 – Special effects software for photography enthusiasts. Vintage Scene is the best special-effects software for photography enthusiasts, turning a new or recent photo into an old photo, one that looks like it was taken many years ago. This unique algorithm automatically combines several classic effects: sepia tone, grain, darkened edges, distressed paper, along with the look of fade that with time has left behind an image with only bright blacks and darkening whites. Vintage Scene is easy to use, but gives the user control to change each component for a unique look on each photo. Built with power to produce high-resolution images, this app will apply the most sophisticated photo filters to your images. Vintage Scene quickly and easily creates compelling photos for graphic artists, photographers, and hobbyists who rely on a high-quality end result. Next story SofaPlay 1.2.6 – Media Streaming Made Easy. Previous story Flood 1.6.5 – Photoshop plug-in submerges objects in realistically rendered water. Diagrammix 2.1.0 – Build better diagrams, faster. AmpliTube 3.11 – Craft the ultimate guitar tone.